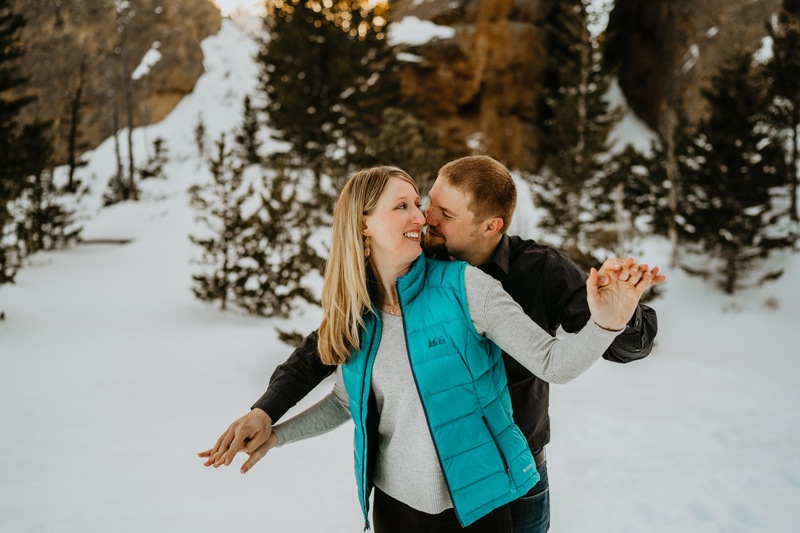 Jen & Ted’s Lily Lake Engagement Session almost never happened. When these two reached out to see if I was available, I already had another couple interested in their date. Thankfully, their date became open, and I was able to secure these two awesome people on our calendar. As we began chatting about their engagement session, we came up with a bunch of locations. We had to narrow the final destination to one spot. We decided to head up to Estes Park, and hike around Lily Lake. The location we chose was a spot that I haven’t been to in years. It’s a short hike around the lake up to a climbers paradise. Climbers and locals alike call this place Jurassic Park. It’s a unique location with some amazing rock formations and in the background, Longs Peak shows it’s face. With the sun shining down on us, I knew we needed to find shade for their session. I was hoping that by the time we reached the final destination, the giant rock formations would grace us with some shade. We started the hike around Lily Lake and made the trek up to Jurassic Park. The trail up to Jurassic was snow packed and steep. At times we were sinking in up to our knees with snow. By the time we reached our final spot, the trail leveled out and gave us a glimpse of what we would be working with. It was perfect! There we shade, snow, and the view was to die for. I couldn’t have asked for more a perfect place to shoot Jen & Ted’s engagement session. We spent most of our time around that Jurassic area, and as the sun started to set, we made the descent down to Lily Lake where we finished up their session. Here is a little peek of what we got into…..enjoy! Are you engaged? If so, contact us to start your adventure.